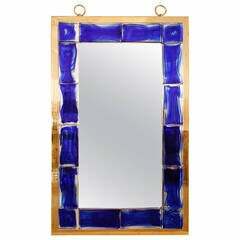 "Tafla O4" contemporary mirror by Zieta Stainless steel Measures: 123 x 64 x 6 cm. More shapes and sizes are available (see picture attached). Starting at 750€ Zieta is best known for his collection of stools “Plopp” made through the technologist FIDU. With the same principle Zieta Prozessdesign conceived mirror collections made of stainless steel called “Tafla”, “Rondo” and “Rondel”. Two laser-cut metal sheets are first welded together before air is injected between them until they separate from each other forming a three-dimensional object. Customer can choose from: \n- Shapes\n- Sizes\n\nSee the last picture attached with all different shapes, dimensions and prices. Starting at 750€. Ein umwerfender Spiegel mit blauen Glasfliesen und einem Messingrahmen.